For those that have a little more time to spend in Beijing, and whose interest in the Great Wall runs a little deeper than the average tourist, our 2-day Great Wall programs are a perfect way to sate your Great Wall appetite! With these two day programs, you'll be able to spend more time on the Great Wall, see more of China's natural beauty, explore relatively unknown sections, and even sleep on the wall itself! (for more information about sleeping on the Great Wall see Routes 2X, 2AA and 2AB) As with all of our other programs, you will receive nothing but the best service and guidance. In accordance with our 1-day programs, you will be picked up in the morning by your travel guide and driver. Your travel guide, who has gone through the strictest safety criteria in the country, will be with you at all times during your Great Wall hike, ensuring your safety while also imparting you with his/her vast knowledge of the Great Wall. 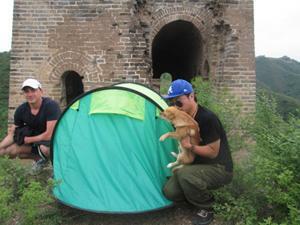 In addition, all heavy camping materials and provisions will be provided (such as tents when sleeping on the Great Wall). The parts of the Great Wall we will encounter are often empty, allowing you to have some quality one-on-one time with one of the world's great wonders. For those hearty outdoor types who live a challenge and trying something new, this is the perfect way to explore the Great Wall of China! In addition to sleeping on the Great Wall, this tour quite nicely introduces you to China both modern and ancient, and for a two day trip, pretty much shows you the best of Beijing, using your time in the best way possible. The tour starts with a visit to the Forbidden City, which for over 400 years was China's home to the Emperor and his imperial retinue. After our visit, we'll cross over to China's modern political center, Tiananmen Square. Then it is off to the Olympic Green, the area where China hosted the 2008 Olympics. We'll then set out for the meat of the trip by going to the Great Wall at Jinshanling, famed for its brick work, watchtowers, and sweeping vistas. Tonight, in one of Jinshanling's larger watchtowers, you'll get to sleep under the stars on the Great Wall! The next day you'll hike to Gubeikou, an unrestored piece of “wild” Great Wall, before being driven back to your hotel.